I did a brief internet search for the meaning and origin of the surname Gauger, focusing on its German origin. I found several sites that were commercial in nature, selling coat of arms, family crests and descriptions of the origin of surnames. Apparently, the surname of GAUGER was an official name, "the gauge", meaning a measurer and tester of wheat and barley. It was also occasionally used as an occupational name for a moneylender or userer, from the Old French word "gage", or pledge, surety against which money was lent. Other records of the name include GAGE, GAUGE, GAIGER, DUGAGE, DAGET, GAGEOT, GAGELIN, and GAGEY, to name a few. I have no way to verify the authenticity of this coat of arms, but it is fun to speculate and delve into the origins of the GAUGER surname. Someone with a nice graphics computer in his or her basement in the desert of New Mexico or the high plains of North Dakota was happy to take my money and create this "authentic" German coat of arms, modifying slightly another coat of arms ordered by another gullible buyer. I will adopt this as it is great and I am so proud to be a GAUGER! Thanks for the research and fun way to solidfy our wonderful heritage. I got the Gauger name from my father though I am 80% itallian. 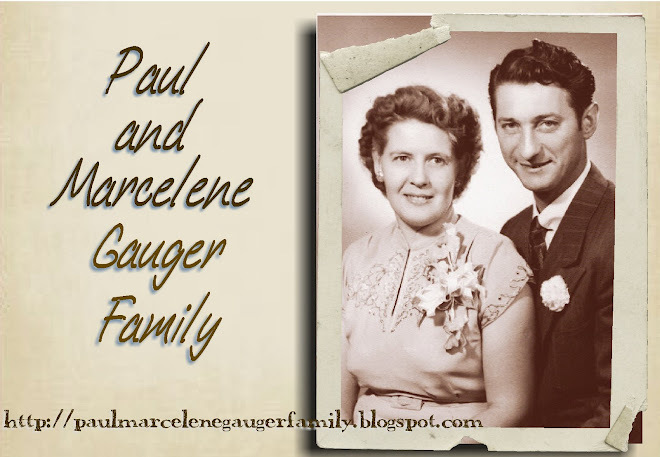 I read somewhere that the Gauger name comes from Austrian Decent, and somewhere else that it is of French decent.